Successfully Added LED Bluetooth Skateboard Speaker - Hand Free, Caller ID, LED Lights, 2 X 3W Speakers, 800mAh Battery to your Shopping Cart. There are countless Bluetooth speakers available but not many come with such a fabulous design. This speaker is shaped just like a skateboard and rocks LED lights that accompany the fantastic audio output. It’s light and portable so makes an amazing travel companion and lets you show-off your moves. Two 3 Watt speakers will blast out all your tunes in great stereo quality and bring a clear crisp sound with great depth. You can easily connect it to any of your Bluetooth supported devices such as Smartphone or tablet and enjoy wireless music from up to 10 meters away. With a micro SD card slot, USB play, Aux in and FM radio there are plenty of other ways to enjoy your music if your player doesn’t support Bluetooth. When the music is playing you can select different lighting modes so the speaker will light up to the music and create your own mini lightshow to accompany the rhythm and beat of your tunes. You can also adjust the volume and skip tracks without interacting with your phone. A built in microphone and hands free function means you can answer calls directly from the speaker itself and the caller ID feature will announce the number of any incoming call so you know who is contacting you. This skateboard speaker has a built in 800mAh battery that provides lighting and musical power for around 5 to 8 hours, plenty of time for you to party the night away. 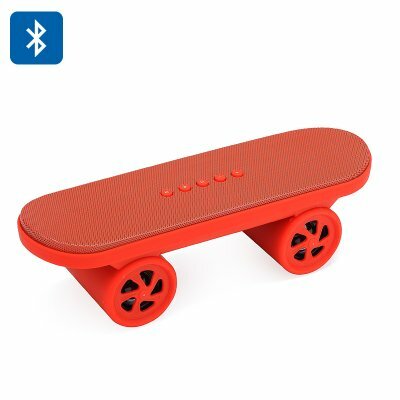 This LED portable Skateboard Bluetooth speaker comes with a 12 months warranty. Brought to you by the leader in electronic devices as well as wholesale Bluetooth Speakers..